The April 8th school board meeting, which was held at Westfield Elementary, focused on several initiatives taking place in our elementary schools to improve student literacy. Director of Elementary Teaching & Learning Karla Reis led the conversation that covered the Formative Assessment System for Teachers (FAST), Language Essentials for Teachers of Reading and Spelling (LETRS), Lexia, and English Language Arts Iowa Core alignment and curriculum development. 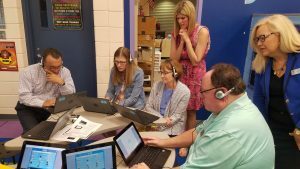 Also during the work session, representatives from the Second Grade Curriculum Team held breakout sessions for board members and administrators that focused on LETRS and Lexia. The complete presentation can be found in Exhibit 301.1 in the board packet. During the regular meeting John Tursi, Executive Director of the Boys & Girls Clubs of Cedar Rapids, provided an update on the future Marion Youth Center. Superintendent Bisgard gave an update on the 5th/6th grade intermediate buildings and discussed the district’s campaign to Name the New Schools. Nominations can be submitted via an online form through April 15th. A committee to review the submitted names is being established and the is scheduled to approve the names during their regular meeting on June 10th. Chief Financial/Operating Officer J.T. Anderson also shared an overview of the proposed certified budget for fiscal year 2020. Click here to view the full agenda and exhibit packet. The school board will host their next meeting on Monday, April 22nd in the boardroom of the Learning Resource Center. The work session will begin at 5:00 pm, followed by the regular meeting at 7:00 pm.